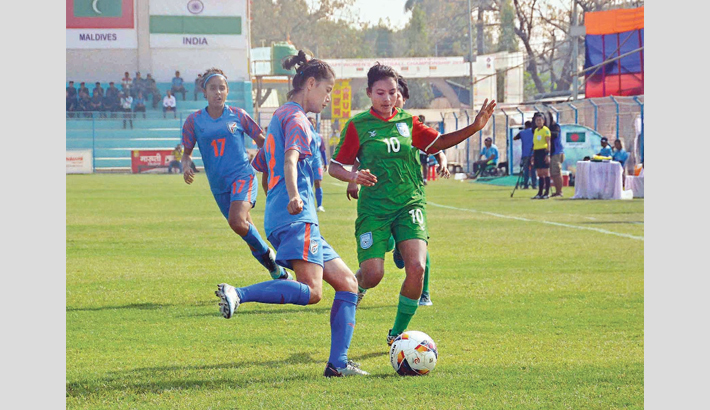 Bangladesh National Women Football Team’s wish of breaking into the final for the second successive time was washed away as defending champions India obliterated them by 4-0 goals in the second semi-finals of the SAFF Women’s Championship 2019 at Sahid Rangashala Stadium in Biratnagar, Nepal on Wednesday. Indumati Katheresan scored twice on both sides of goals from Dalima Chibber and Manisha to keep India in the pursuit of defending their title for the fifth successive occasion. Bangladesh could not fight on par with the much superior Indian side as the women in blue bagged three goals in the first-half and practically sealed the match before coming on to score the fourth goal just a minute before the final whistle. The first goal of the match revealed a persistent sore of Bangladesh squad which has been their keeping. Bangladesh goalie Rupna Chakma couldn’t bag the corner from Sanju as Dalima utlised the opportunity to flick into an open net to put India 1-0. Midfielder Sanju later went on to set up India’s second goal of the match in 23rd minute with Indumati bulleting a sensational goal into left corner of the post. Bangladesh being down 2-0, pressed hard to make a comeback into the game, but conceded their third goal from a counter-attack as Indumati redirected a cross of Sandhiya Ranganathan into the post in the 37th minute. India will now take on Nepal in the final on Friday as the hosts earlier beat Sri Lanka by an identical margin in the first-semi-final to book their place in the final for the fourth time. The women in red and green got on the backfoot in the sixth minute when Masura Parvin headed the ball into her own net, and since then it was a matter of Bangladesh trying to keep out the Nepal attacks. Experienced forward Sabitra Bhandari doubled the lead in the 23rd minute before she set up Manjuli Kumari for the third later in the half. The result means Bangladesh will play their semifinal against the champions of Group B either India or Sri Lanka on March 20. Earlier, Bangladesh confirmed their semi-final berth with a triumph over Bhutan by 2-0 goals during their SAFF Women’s Championship Group A encounter at Sahid Rangashala in Nepal on Thursday. With this emphatic win, Sabina Khatun and co advanced to the semi-final of the tournament with a match in hand as Bhutan lost their earlier encounter against hosts Nepal in the tournament opener. Youngster Mishrat Jahan Mousumi and skipper Sabina Khatun scored for the Red and Greens to land the semi-spot of this much coveted title.